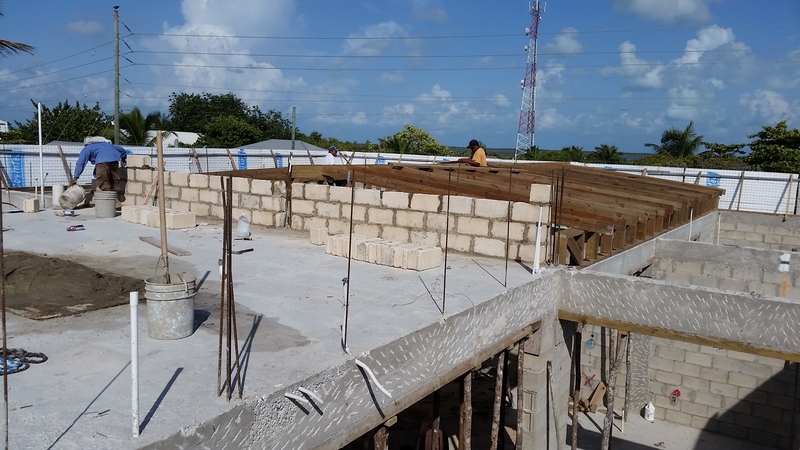 Building in Belize…what a difference a day makes! Jinx gets in an early morning stretch before moving a ton of bricks to the 3rd floor!! A lot of people come by the project – tourist and locals – and almost everyone says the same thing. “Slowly but surely it’s coming up”. My reply to all of them is the same, “It sure doesn’t seem slow to me!” We’ve been at it now for a little over 5 months and it seems like time has flown by. After we finished the 3rd floor cast, we didn’t slow down a bit. The next day blocks were being hoisted to the top to begin the railing around the rooftop entertainment area, which is about 1,000 sq ft. While the carpenters start from one end with the roof peak, another crew starts forming the parapet wall “cantilever” that will surround the entire rooftop. It will become the floor of the box-gutter and will also be the base for the parapet wall. This enclosed gutter system and parapet wall are important for a couple of reasons. First, this wall will be higher than the finished roof. This is a Miami-Dade County hurricane spec that will “in theory” allow a hurricane to pass over the top of the roof without being able to peel up an edge and lift the roof. Second, it will enclose the gutter system so there won’t be any impedance to water going to the cistern. Finally, it is a heck of a lot nicer looking from the ground when there are no exterior gutters. Here is a progression of the parapet and roof system – over a 3 day time period. The white material in the final picture is called Covintec. It is a foam material with plaster-wire running through it and around the outside of it. It is formed in place using re-bar that is tied into the roof beam and cast along with the beam. It’s also reinforced with re-bar that runs along the top and around the corners to form one continuous wall. When plastered on both sides and top with an inch and a half of cement, it becomes solid as a rock. It is the perfect material for this application because there are no tubes or pipes running through it and it is light weight, but still meets the specification we need. The Covintec goes in quickly and the guys get the roof peak set. A crew starts setting the roof rafters while the guys start hoisting blocks to the rooftop. A crew starts setting blocks on the West side of the rooftop so that the roof-peak can be attached and locked in. Within two days, the rooftop block is set, the roof locked in and 80% of the rafters have been set. Seem slow and sure to you??? When all rafters are set, the crew goes back and ties everything in with hurricane straps. Nothing beats cheap insurance, right! We may have gone a little overboard with the straps – using double or triple the amount called for. But every rafter is strapped in place and is firmly anchored to the sill plates, which are set in the concrete and tied in to the beams using stainless steel threaded rods. I can’t see how this roof is going ANYWHERE, but I’ve also never seen a Category 5 Hurricane. Hopefully I never will! This is the “crane” and Luis in action, moving tied steel to the rooftop. Notice the shadow of the man on the rooftop guiding it up (Jinx). 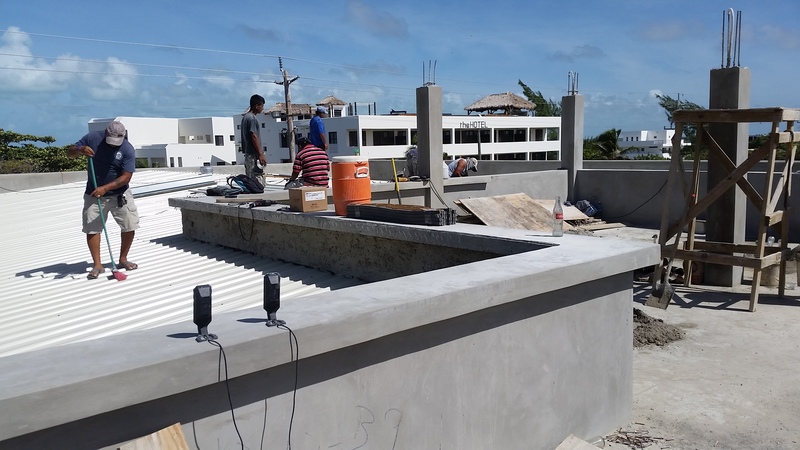 While this is happening, the plaster crew has finished the first floor (right on schedule) and joined our crew on the rooftop to start the arduous task of plastering the Covintec and finishing the box-gutters. Keep in mind that every thing is now coming to the rooftop via a hoist, rope and pulley. This means EVERY block, ALL cement (94-lb bags), sand, gravel and water (via 5-gallon buckets!) The “crane” is going non-stop all day! Juan Diaz comes up and shares the excitement. As always, he has a few suggestions. This has become a typical conversation: “Mr. Mike, we have gas right over here that we can run over there so you can put in a rooftop BBQ grill”. Me, “perfect, that’ll save me from running up and down the stairs”. Juan, “wouldn’t it be nice to have some lights under this counter and an outlet hidden here for some Christmas lights?” Me, “I was thinking the same thing, Juan”. Him, “if you want, I can run cable up here so you could put a TV to watch football?” He means soccer, but I’m thinking “Ohio State Football, baby”…”great idea, Juan!” OK OK, you can stop asking now!!! Omar standing 2nd from right, age 12 maybe??? 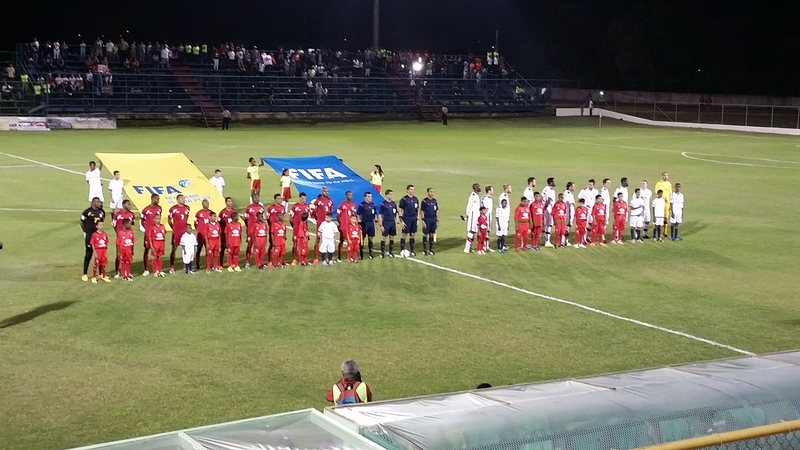 On a tangent: A friend of mine, Rob (of Day Dreamin’ Belize), who is largely responsible for hooking me up with Omar from the beginning, invited Omar, Juan Diaz and I to go to the Canada vs Belize World Cup qualifier in the capital city – Belmopan. Juan and Omar have been playing football together since they were little. Juan arranged the tickets and hotel, and we all flew in like VIP’s on Rob’s Twin Engine rocket ship for the game!!! 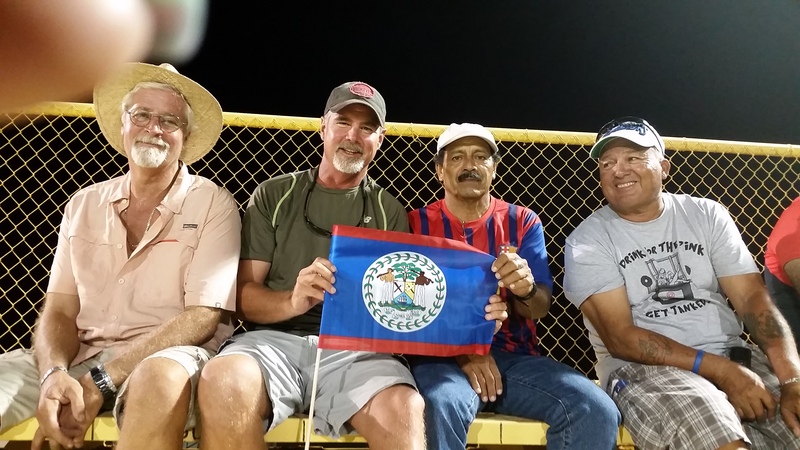 Belize eliminated in the 1-1 tie, but WOW, what an AWESOME experience!!! As the roof framing continues, Erwin is back at it again, working on the 2nd spiral stairway that will connect the 2nd floor veranda to the rooftop. This is a long process that takes shape over 2-1/2 weeks. Erwin usually works alone, but Omar assigns a helper to move it along. It’s a detailed task that takes a lot of math, measuring, cutting nailing. It looks like it’s going to be a spectacular addition – a mirror image of the one below it! Patch (Left) and Pablo installing ridging and ridge vents. Slowly but surely??? Anything but!! Also while this is going on upstairs, Juan and his sons are busy at work downstairs, finishing the rough electrical, cable, internet and plumbing. When the rooftop is finished, the plaster crew starts the exterior of the building, beginning with the north side of the building, then progressing to the east side (seafront). They have added 4 additional guys (now up to 8) and have also begun leveling the first floor. This is important as we are now all set for TILE!!! Hard to believe that they will be setting tile next week, but we are currently 16 days ahead of schedule. The roof is on the schedule to be completed by October 1 and it is DONE on September 14th! Acknowledging things aren’t always perfect, we need to talk about Mahogany. We ordered 4,000 board feet of Mahogany for doors and cabinets for the project. It should have gone to the kiln, been dried and delivered by the end of August. Small glitch. The salesman, Gustavo, starts playing games with the order and evidently failing to tell the truth when asked direct questions. It cost me two trips to the mainland, including one overnight stay. 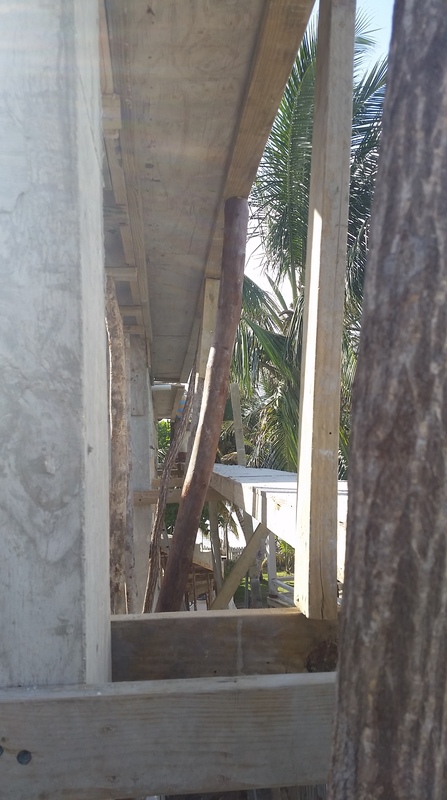 I traveled from San Pedro, to Belize City, to Orange Walk, back to Belize City, then to San Pedro to look at wood I thought we bought, but later found out, we DIDN’T. 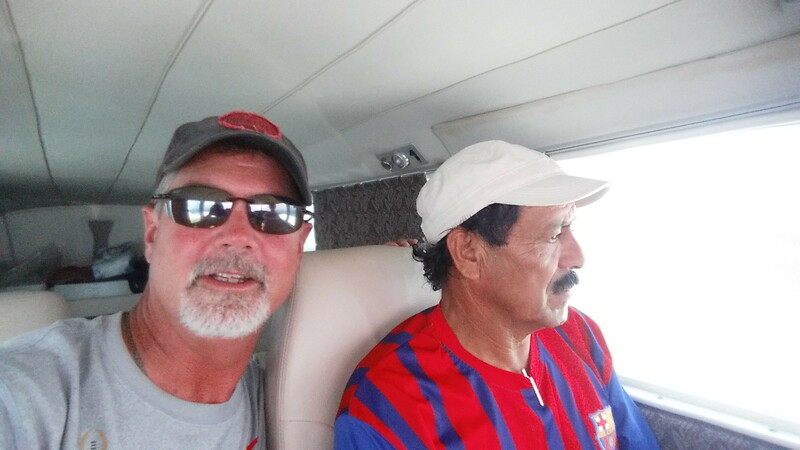 The second trip was San Pedro, Belize City, Orange Walk, then to Little Belize, (which I think it’s safe to say is in the middle of no where, just past the outskirts and up the road from the middle of NO WHERE! ), back to Belize City. 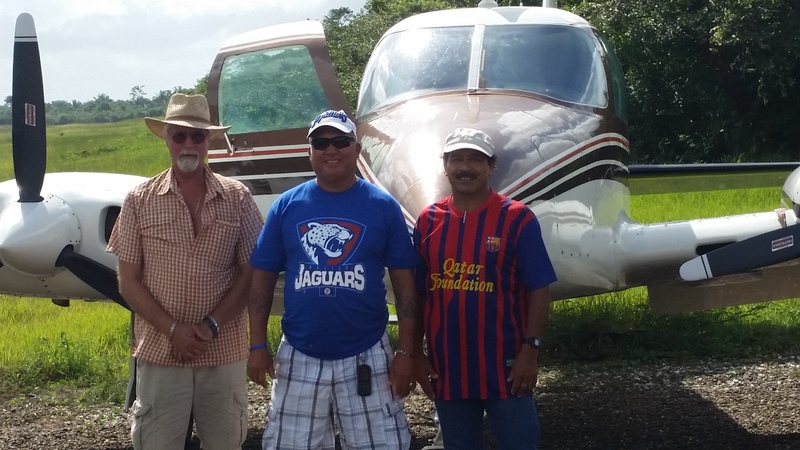 The next day we went Belize City to Spanish Lookout and then back to San Pedro. At this moment in time, I still do not have any Mahogany. This is causing a lot of heartburn since we are resolved to keep our deadlines. We have been discussing hiring a second and maybe third cabinet-maker so that we can spread the doors and cabinets out in order to meet our deadline. Needless to say, GUSTAVO and I are not on the best of terms. Fortunately it was half up front and half on delivery, so we’ll see how that half on delivery part goes. On a positive note, because of this experience, I have become a Mahogany professional and have seen parts of Belize that I never would have otherwise. I spent a lot of time on dirt roads, crossed a river on a hand-cranked ferry for the fee of “any donation is good”, and met some very nice and honest Mennonites in Little Belize and Spanish Lookout who tell it like it is (much appreciated). Special thanks to another friend of mine, Brian “Mac” McCarron for coming along on “Mac ‘n Mikes Big (Belize) Adventure”!! Fresh logs being cut to length on a giant sliding saw in Little Belize. Our Mahogany ready to go to Spanish Lookout’s kiln. Yes, that is a friendly calf standing there guarding it! Mac holding onto the rest of our Mahogany. A cool old steel-wheeled tractor. Made in what year do you guess? Well, it is Independence day here in Belize – September 21. 1981 I believe, so we have a much-needed day off! We cast the 2nd spiral staircase on Saturday so you’ll have to come back soon to see some more great pictures. As always, thanks for reading and sharing in our tropical building adventure. We hope to start taking some pre-bookings (contingent upon our being open!) for January 1st 2016. So if you’re thinking you might want to bet on us being done on schedule, stay tuned to TwistedPalmVillas.com. Thanks again for liking us and following us. Keep the questions, comments and support coming!!! Mike – the place looks great! So happy to hear that you are ahead of schedule. I am sure that is a huge relief … Or as much relief as you can get with a project this size. Our plan is still to try tovisit next year. I’ll know better in February and hopefully we can start to make plans. I can’t wait to see you and Laura again! Our love to you both! Hi Mike Coen, Great to hear from you and hope to see you early next year!! Sounds like you had a busy weekend, my friend!!! Congrats to you all! It looks like it was a great time had by all!